Reed, Ian, and Eric Arneson, Meadow, South Dakota, with Gary Wilken. 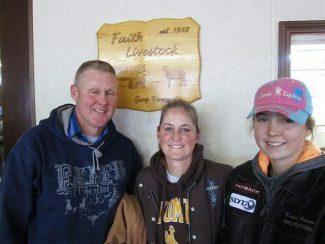 Kevin, Buffy, and Kailyn Groves, Faith, South Dakota, bought three Final Answer sons, including Lot 5120 at $6250. Diana and Daryl Thompson, Akaska, South Dakota, bought the top draft of heifer calves at $850. 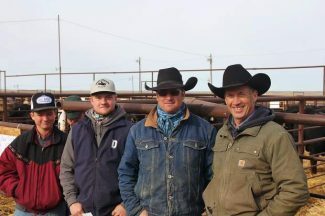 Wilken Angus hosted their second annual fall two-year-old Angus bull sale at Faith Livestock. 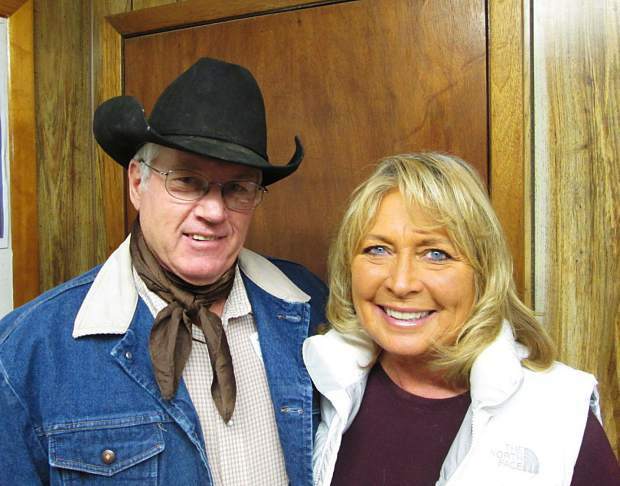 This herd is owned by Gary and Lori Wilken and family, and they believe in making their customers happy. Consequently, most of the crowd were repeat buyers. This was a big, stout set of virgin 2-year-old bulls that were all AI sired. Wilkens use only high accuracy AI sires, and keep tight production records on all of their females. This group of bulls were sired by Sitz Dash, Final Answer, Barstow Cash, AAR Ten X, Connealy Confidence, Hoover Dam, Soo Line Motive, and PA Power Tool. Disposition, calving ease, and lower energy requirements are priorities for the Wilken breeding program. These bulls were especially docile out in their pens before the sale. The top selling bull of the day was Lot 5171, selling for $7,500 to Floyd Cammack from Union Center, South Dakota. This thick son of Soo Line Motive was out of a daughter of New Design 878. Born at 88 pounds, he weaned at 592 pounds, and weighed 1,395 pounds on Oct. 18, 6. He had a 13.7 square inch rib eye. Norman Miles from Meadow, South Dakota, bought Lot 518 at $6,500. This son of AAR Ten X 7008 SA was out of a daughter of Premium Beef. He was born at 90 pounds, weaned at 647 pounds to ratio 110, and reached a yearling weight of 1184 pounds to ratio 112. His weight on October 18th was 1,570 pounds, and he had a 13.1 square inch rib eye. His IMF score was 4.47 to ratio 161. His Zoetis i50K numbers included CED 61, BW 65, WW 63, YW 37, MILK 61, SC 15, DOC 33, MARB 34, and RE 42. Lutz Ranch from Faith, South Dakota, bought two good bulls in Lots 539 and 586 at $6,500 each. Lot 539 was a son of Barstow Cash and out of a daughter of Expectation who had an MPPA of 106. He had a birth weight of 85 pounds and a weaning weight of 651 pounds to ratio 109. He weighed in at 1410 pounds on Oct. 18. Lot 586 was a son of Sitz Dash and out of a Rito1I2 daughter, going back to TC Rancher. With an 88 pound birth weight, this big, smooth made bull weaned at 662 pounds to ratio 113. His yearling weight ratio was 112, with an October weight of 1,515 pounds. Mike McQuistian from Ft. Pierre, South Dakota, topped his purchases with Lot 540, a big, stout son of Barstow Cash. Mike paid $6750 to own this powerful bull that was out of a Predestined daughter, and had weaned at 649 pounds. This bull weighed 1615 pounds on October 18. Kevin and Buffy Groves from Faith, South Dakota, selected Lot 5120 at $6,250. This good-looking bull with extra length was by SAV Final Answer and out of a Rito 6I6 daughter. The top draft of open heifers brought $850 from Daryl Thompson of Akaska, South Dakota. This was a really good sale with great hospitality. The bowl of soup that accompanied the delicious sandwiches was greatly appreciated on this cool winter day. Before heading home, everyone could choose a fancy cupcake with a dollop of ice cream.